The liver-derived McNtcp.24 cells transport bile acids and show distinctive responses to the two classes of conjugated bile acids. Whereas taurine-conjugated bile acids are non-toxic, glycine-conjugated bile acids efficiently induce apoptosis. The aim of this study was to determine if the differential sensitivity is limited to cells that normally transport bile acids and if bile acid binding proteins could reduce bile acid-mediated apoptosis. The apical sodium/bile acid co-transporter (asbt) was expressed in Chinese hamster ovary (CHO) cells to establish active bile acid transport in a non-liver-derived cell model (CHO.asbt). A high-affinity bile acid binder was expressed in McNtcp.24 cells. The tolerance of McNtcp.24 cells to taurine-conjugated bile acids was associated with the stimulation of phosphatidylinositol 3-kinase (PI3K) activity. Treatment of CHO.asbt cells with taurine- and glycine-conjugated bile acids resulted in apoptosis. Unlike in McNtcp.24 cells, PI3K activity was not increased in CHO.asbt cells treated with taurine-conjugated bile acids. High level expression of a bile acid binder did not attenuate bile acid-induced cytotoxicity in McNtcp.24 cells. The data suggest that McNtcp.24 cells possess a mechanism that can elaborate distinctive responses to the different classes of bile acids. Additionally, activation of a signaling pathway involving PI3K appears to be the dominant mechanism responsible for the tolerance of McNtcp.24 cells to taurine-conjugated bile acids. The liver exclusively synthesizes bile acids from cholesterol via two biosynthetic pathways. The "classical" pathway begins with the 7α-hydroxylation of cholesterol and operates entirely in the liver . The "alternative" pathway begins with the hydroxylation of the cholesterol side chain. Although this reaction occurs in a wide variety of cells, the completion of bile acid synthesis takes place in liver cells. The classical pathway is responsible for the bulk of the bile acids synthesized by the liver [2, 3]. The major bile acid species produced by the liver are cholic and chenodeoxycholic acids. These bile acids are conjugated to either taurine or glycine before secretion into bile , which is subsequently released into the small intestine. Bile acids are reclaimed from the lumen of the intestine and returned to the liver via portal blood for reuse . The recovery of bile acids from the intestine is an efficient process that involves both passive transport along the entire axis of the intestine, and active transport in the terminal ileum . The apical sodium/bile acid co-transporter (asbt) mediates the active uptake of conjugated bile acids in the ileum [5, 6]. In hepatocytes, both sodium-dependent and sodium-independent transport systems on the sinusoidal membranes extract bile acids from portal blood. Of these, the sodium/bile acid co-transporting polypeptide (ntcp) is considered to be quantitatively the most important transporter of conjugated bile acids in these cells [7, 8]. The transport of bile acids from the basolateral to the canalicular membrane of liver cells is a poorly understood process. Intracellular bile acid binding proteins have been postulated to participate in the transcellular transport as well as to buffer against the cytotoxic effects of bile acids. ATP-dependent transporters on the canalicular membranes of hepatocytes mediate the secretion of bile acids into bile . Recently, it was discovered that bile acids are the natural ligands for a nuclear receptor termed farnesoid x receptor (FXR; NR1H4) [10–12]. Therefore, bile acids may be important regulators of gene expression in the liver and intestines. To date, the genes that have been shown to be responsive to regulation by FXR encode proteins involved in the biosynthesis and transport of bile acids . Bile acids have been shown to modulate a variety of other cellular functions, such as secretion of lipoproteins from hepatocytes [14, 15] and translocation of bile acid transporters to the hepatocyte canalicular membrane . In McNtcp cells, which are liver-derived cells engineered to transport bile acids actively , taurine-conjugated bile acids induce the formation of intracellular vesicles that resembles structures observed in cholestatic liver cells without apparent cellular cytotoxicity [1, 18]. In contrast, glycine-conjugated bile acids promote apoptosis in these cells . Thus, different classes of conjugated bile acids stimulate distinctive responses in McNtcp cells. Whereas taurine-conjugated bile acids are well tolerated, glycine-conjugated bile acids are extremely cytotoxic. Here we examined if this differential response is limited to cells that normally metabolize bile acids, and whether high level expression of an intracellular bile acid binding protein can attenuate the cytotoxic response of McNtcp.24 cells to glycine-conjugated bile acids. We previously showed that taurine-conjugated bile acids, such as taurocholic (TCA) and taurochenodeoxycholic (TCDCA) acids, were well tolerated by McNtcp.24 cells . In contrast, glycine-conjugated bile acids, such as glycocholic (GCA) and glycochenodeoxycholic (GCDCA) acids, were cytotoxic to McNtcp.24 cells  concordant with what has been documented in hepatocytes . Consistent with the induction of apoptotic cell death; GCDCA, but not TCA, preferentially induced the activation of the initiator caspase 8 in McNtcp.24 cells (Figure 1A). Indeed, glycine-conjugated bile acids as a class of molecules induced genomic DNA fragmentation in this cell line at low concentrations (50 μM), while their taurine counterparts did not (Figure 1B). The cytotoxicity of glycine-conjugated bile acids cannot be attributed simply to the preferential cellular accumulation of these bile acids because McNtcp.24 cells can accumulate GCA and TCA to similar levels (Torchia and Agellon, unpublished observations). Differential response of McNtcp.24 cells to bile acid treatment. (A) Cells were treated with bile acids (50 μM) for 1 h, and caspase 8 activity was assayed in cell extracts using the fluorogenic substrate, Z-IETD-AFC, as described in the Materials and Methods. Only GCDCA was able to activate caspase 8 in McNtpc.24 cells consistent with its role in the induction of apoptosis. The values shown are mean ± SD (n = 3). (B) Genomic DNA fragmentation in bile acid-treated cells. The cells were incubated with 50 μM bile acids for 3 h and genomic DNA was isolated as described in the Materials and Methods. Glycine-conjugated bile acids induced the DNA laddering pattern indicative of apoptosis. GCA, glycocholic acid; GCDCA, glycochenodeoxycholic acid; GDCA, glycodeoxycholic acid; TCA, taurocholic acid; TCDCA, taurochenodeoxycholic acid; TDCA, taurodeoxycholic acid. The experiments in (A) and (B) were repeated four times with similar results. There is considerable evidence to suggest that bile acids activate a variety of cellular signaling pathways in liver cells . TCDCA is capable of activating PI3K activity in McNtcp.24 cells and, direct elevation of PI3K activity by transient expression of a plasmid encoding PI3K can protect McNtcp.24 cells from GCDCA-induced apoptosis . TCA, like TCDCA, also caused the elevation of PI3K activity in McNtcp.24 cells (Figure 2A), suggesting that activation of PI3K may be a general response to taurine-conjugated bile acids. Treatment of McNtpc.24 cells with LY294002, a PI3K inhibitor, prior to the addition of TCA or TCDCA resulted in the loss of tolerance to these bile acids as demonstrated by the activation of caspase 8 (Figure 2B). On the other hand, preincubation of McNtcp.24 cells with either TCA or TCDCA attenuated the GCDCA-mediated activation of caspase 8 (Figure 2C), suggesting that the activation of a PI3K-dependent survival pathway is dominant over the death pathway. These results also indicate that the differential sensitivity of the liver-derived McNtcp.24 cells to conjugated bile acids is due to the existence of a specific mechanism that is capable of recognizing different classes of conjugated bile acids. In these cells, taurine-conjugated bile acids specifically increase PI3K activity which, in turn, leads to the activation of a survival pathway [22, 23]. PI3K activity in bile acid-treated McNtcp.24 cells. (A) Cells were treated with 100 μM bile acid for 1 h and then PI3K activity in crude membrane fractions were assayed as described in the Materials and Methods. Both TCA and TCDCA stimulated PI3K activity. (B) Activation of caspase 8 in bile acid-treated McNtcp.24 after pretreatment with 20 μM LY294002. McNtcp.24 cells were treated with LY294002, a PI3K inhibitor, for 30 min before incubation with 100 μM TCA or TCDCA for 2 h. Note the loss of tolerance of McNtcp.24 cells to taurine-conjugated bile acids as reflected by the activation of caspase 8 activity (middle and right bars). (C) McNtcp.24 cells were incubated with TCA or TCDCA for 30 min before incubation with 50 μM GCDCA for 1 h. Note the attenuation of caspase 8 stimulation when McNtcp.24 cells were exposed to taurine-conjugated bile acids prior to GCDCA treatment (fourth and last bars). The values shown are means ± SD (n = 3). Differences in comparison to controls (no addition in (A), (B); GCDC-treated cells in (C)) were evaluated using Student's t-test. *P < 0.05; **P < 0.001. The experiments in (A), (B), and (C) were repeated three times with similar results. To determine if non-liver derived cells also posses differential sensitivity to bile acid-induced cytotoxicity, we engineered CHO cells to take up bile acids actively by expressing asbt. Colonies surviving the selection process were assayed for asbt activity and several clones showing a range of bile acid uptake activities were selected for further analysis. Analysis of total RNA from the selected clones (CHO.asbt) readily showed the presence of the recombinant asbt mRNA (Figure 3A). Correspondingly, in CHO.asbt lysates, an immunoreactive band of comparable size (~45 kDa) to rat asbt protein can be easily detected using an anti-asbt antibody (Figure 3B). The uptake of bile acids by the CHO.asbt cells was saturable with an apparent Km ranging between 22 to 25 μM (Figure 3C). The Vmax values ranged from 0.323 to 2.769 nmol/mg protein/min and correlated with the abundance of the recombinant asbt mRNA encoded by the transgene. The uptake of 25 μM TCA by CHO.asbt.8 and CHO.asbt.35 cells reached steady state within 10 min (Figure 3D), implying the presence of a pathway for bile acid efflux in CHO cells. Furthermore, it was possible to chase the incorporated radiolabeled TCA from CHO.asbt.49 and CHO.asbt.35 cells (Figure 3E). These results demonstrate that CHO.asbt cells express a fully functional asbt protein. Expression of recombinant apical sodium/bile acid transporter (asbt) in CHO cells. (A) The 1.7 kb recombinant asbt mRNA is readily detectable in total RNA (10 μg) of selected CHO.asbt clones. Note the absence of this band in total RNA of CHO cells. (B) The recombinant asbt protein is also readily detectable by immunoblotting in total lysates (20 μg) of CHO.asbt cells, but not of CHO cells. The recombinant asbt protein is similar in size to the authentic asbt detectable in rat ileal cell extracts. (C) CHO.asbt cells show saturable and concentration dependent uptake of taurocholic acid (TCA). The apparent Km for TCA range from 22.4 to 25.9 μM. (D) Time dependent uptake of TCA in CHO.asbt and CHO cells. TCA uptake reaches a maximum at 10 min. (E) Efflux of TCA from CHO.asbt.49 and CHO.asbt.35 cells. The cells were incubated with 25 μM [3H]-TCA for 20 min to label the intracellular pool of bile acids. The amount of radioactivity that remains associated with the cells after the removal of radiolabeled TCA from the medium is shown. The values represent means ± SD (n = 3). The experiments in (A), (B), (C), and (D) were repeated twice with similar results. The increase of LDH activity in the culture medium of CHO.asbt.35 and McNtcp.24 cells after treatment with glycine- and taurine-conjugated bile acids were compared to assess the cytotoxic potential of bile acids on these cells. The CHO.asbt.35 cell line was chosen for this study because this cell line has bile acid uptake activity that was comparable to McNtcp.24 cells . 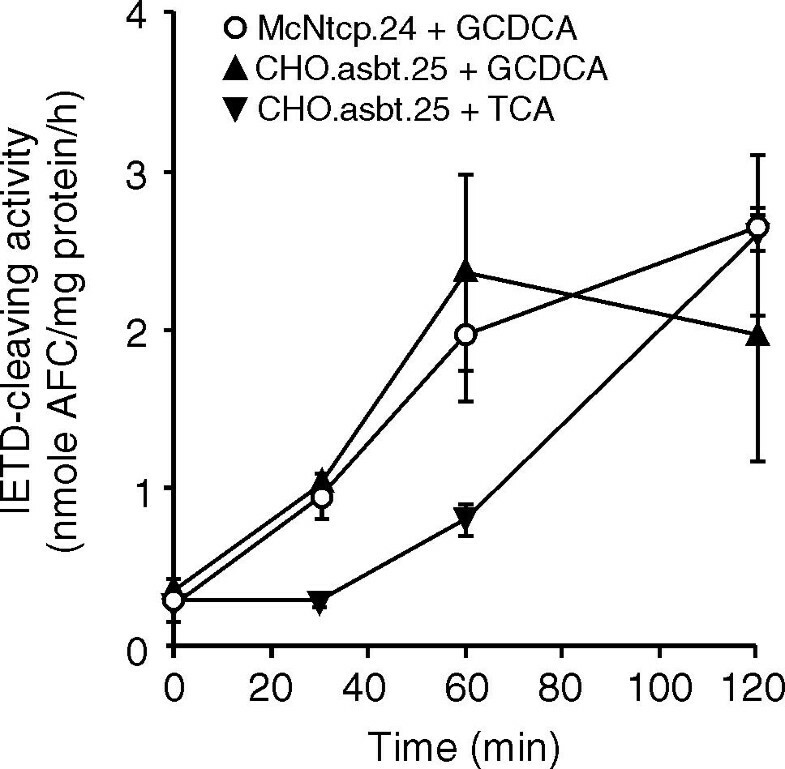 LDH activity in the culture medium of McNtcp.24 cells increased by 20 to 31% within 2 h of incubating the cells in medium containing 100 μM of glycine conjugates of cholic acid, chenodeoxycholic acid, and deoxycholic acid (GCA, GCDCA, GDCA, respectively) (Figure 4A). GCDCA was the most potent in inducing the release of LDH among the bile acids tested whereas TCA had little effect as compared to the no addition controls. In contrast, incubation of CHO.asbt.35 cells in medium containing 100 μM of taurine- or glycine-conjugated bile acids resulted in a time dependent increase of LDH activity the culture medium (Figure 4B). 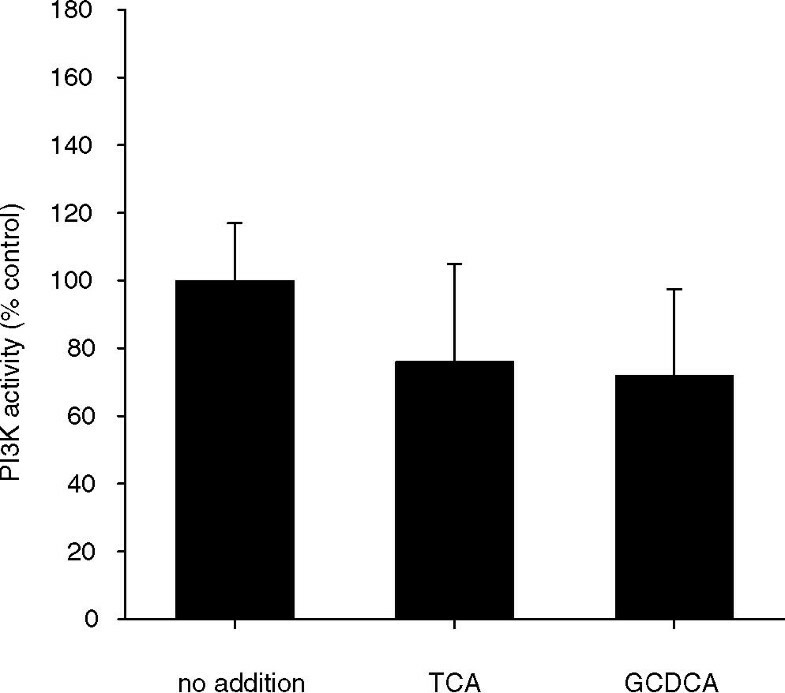 GCA and GCDCA were equally potent in increasing LDH activity, raising the level in the medium of treated cells by 40% within 6 h. Taurine-conjugated bile acids also raised the LDH activity in the medium of treated cells to levels approaching GDCA-treated cells (Figure 4B). Treatment of McArdle RH-7777 and CHO cells with taurine- or glycine-conjugated bile acids had little effect on the release of LDH (Figure 4C and 4D), indicating that bile acid uptake activity is necessary to manifest their cytotoxic potential in both cell lines. In addition, the cytotoxicity was specific to conjugated bile acids since the addition of non-conjugated bile acids to the culture medium of bile acid-transporting cells had a negligible effect on the release of LDH into the culture medium. Lactate dehydrogenase (LDH) activity in the medium of bile acid treated cells. McNtcp.24, CHO.asbt.35, McArdle RH-7777, and CHO cells were incubated in medium supplemented with bile acids (100 μM). (A) Glycine-conjugated bile acids, but not TCA, induced the time dependent release of LDH in the culture medium of McNtcp.24. (B) Both glycine- and taurine-conjugated bile acids induced the release of LDH from CHO.asbt.35 cells. Neither glycine- nor taurine-conjugated bile acids induced the release of LDH in McArdle RH-7777 (C) or CHO (D) cells after a 5 h incubation. The means ± SD (n = 3) are shown per time point. These experiments were repeated six times with similar results. Members of the caspase family of cysteine proteases have been implicated in the initiation and execution phase of apoptosis . In addition, several studies have shown the activation of the caspase cascade by toxic bile acids in hepatocytes [25, 26]. We thus measured caspase activity after bile acid treatment in CHO.asbt.35 cells. 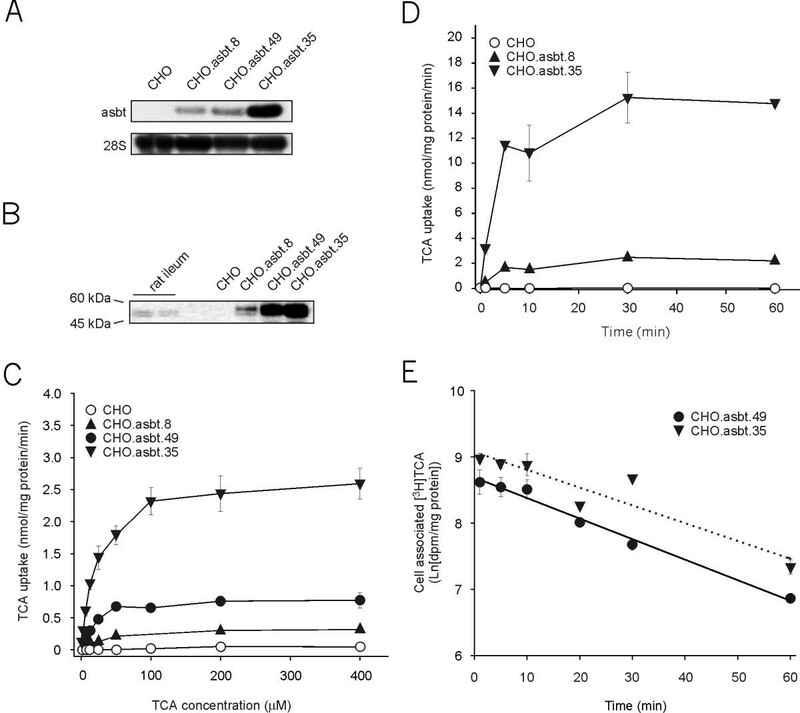 Activation of caspase 8 was detected in CHO.asbt.35 cells after treatment with either taurine- or glycine- conjugated bile acids (Figure 5A), but absent in bile acid-treated CHO cells (Figures 5A). Analysis of genomic DNA isolated from treated cells showed that TCA and GCDCA induced DNA laddering in CHO.asbt.35 cells (Figure 5B), indicating that both classes of conjugated bile acids induce apoptosis in this non-hepatic derived cell line. To further characterize the initiation of the caspase cascade, we determined the time course of caspase activation by bile acids in CHO.asbt.35 and McNtcp.24 cells. Activation of caspase 8 in both cell lines was first detected by 30 min following GCDCA-treatment and was maximal by 60 min (Figure 6). In contrast, TCA-mediated activation of caspase 8 was first detected at 60 min and reached the levels induced by GCDCA by 120 min. Apoptosis in bile acid-treated CHO.asbt.35 cells. (A) Cells were treated with various bile acids (100 μM) for 2 h, and then caspase 8 activity was assayed in cellular extracts using the caspase 8 fluorogenic substrate, Z-IETD-AFC. Both glycine- and taurine-conjugated bile acids induced the activation of caspase 8 in CHO.asbt.35 cells (dark bars), but not in CHO cells (white bars). 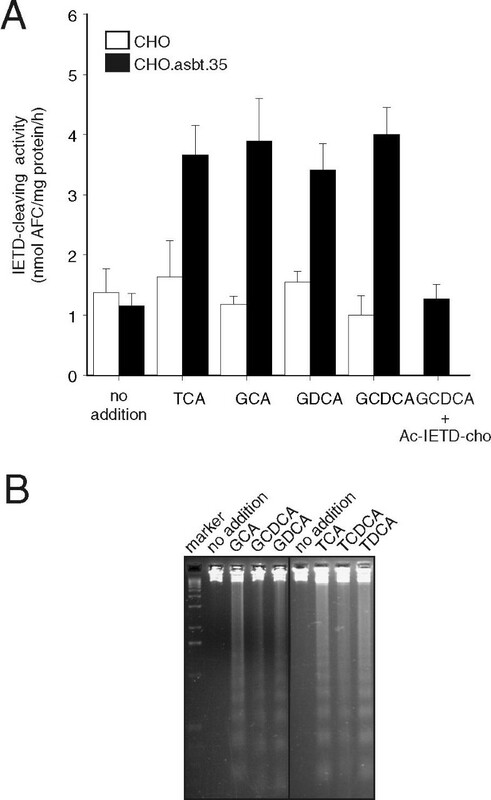 Caspase 8 activity in GCDCA-treated cells inhibited in vitro by addition of the caspase 8 inhibitor Ac-IETD-cho to the cell extracts (right most bar, panel A). The basal level of caspase 8 activity in untreated cells is also shown by the (left most pair of bars, panel A). The values shown are mean ± SD (n = 3) and are representative of several experiments. (B) Fragmentation of genomic DNA in bile acid-treated CHO.asbt.35 cells. The cells were incubated with 50 μM taurine- or glycine-conjugated bile acids for 3 h. Both classes of conjugated bile acids induced DNA laddering in CHO.asbt.35 cells. Original magnification = 400X. These experiments were repeated three times with similar results. Time dependent activation of caspase 8 in bile acid-treated CHO.asbt.35 and McNtcp.24 cells. Cells were treated with 50 μM bile acids. After a time interval, cellular extracts were isolated and assayed for caspase 8 activity. The means ± SD (n = 3) are shown for each time point. This experiment was repeated twice with similar results. Because the bile acid transporters used to establish bile acid uptake activity in McNtcp.24 and CHO.asbt.35 cells were not the same, it was possible that the sensitivity of CHO.asbt.35 cells to taurine-conjugated bile acids was a consequence of asbt expression. To address this possibility, asbt was expressed in McArdle RH-7777 cells and then tested for response to glycine- and taurine-conjugated bile acids. As shown in Figure 7A, asbt conferred active bile acid uptake activity in transfected cells. However, activation of caspase 8 was evident only in the cells that were treated with GCDCA (Figure 7B). These results demonstrate that the sensitivity of this cell line to taurine- and glycine-conjugated bile acids is not dependent on a specific kind of bile acid transporter. Expression of asbt in McArdle RH-7777 cells and induction of caspase 8 activity. 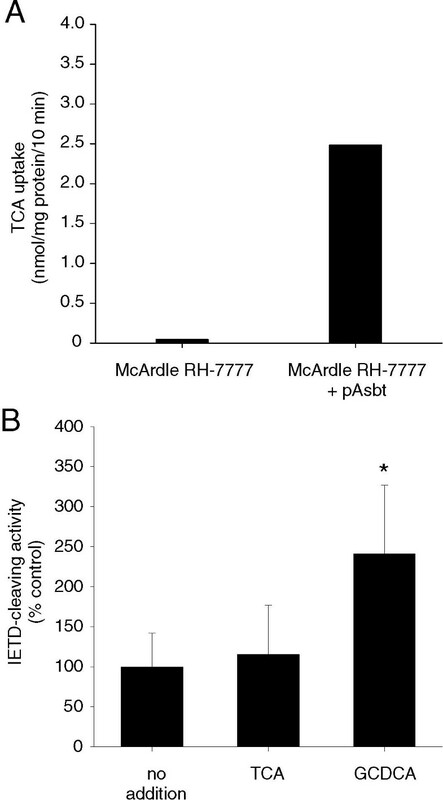 (A) Uptake of TCA was enhanced in McArdle RH-7777 cells expressing asbt. (B) Treatment of asbt- expressing McArdle RH-7777 with GCDCA (right bar), but not with TCA (middle bar), showed activation of caspase 8 activity. The values shown are mean ± SD (n = 6). Differences in comparison to controls were evaluated using a Student's t test. *P < 0.05. The experiment in (A) was repeated twice and the experiment in (B) was repeated three times with similar results. Activation of a PI3K-dependent pathway by taurine-conjugated bile acids appears to decide the fate of McNtcp.24 cells (Figure 2 and ref. ). Therefore, we determined if PI3K activity was altered in bile acid-treated CHO.asbt.35 cells. As shown in Figure 8, PI3K activity in response to TCA or GCDCA was not evident in CHO.asbt.35 cells, suggesting that the inability to activate survival pathways by taurine-conjugated bile acids commit these cells to apoptosis. These findings also indicate that liver derived cells posses a mechanism that responds to taurine-conjugated bile acids leading to the activation of PI3K. PI3K activity in bile acid-treated CHO.asbt.35 cells. Cells were treated as detailed in Figure 2 and PI3K activity in crude membrane fractions was assayed as described in Materials and Methods. In CHO.asbt.35 cells, neither TCA nor GCDCA have an effect on PI3K activity. The values shown are means ± SD (n = 3). This experiment was repeated twice with similar results. It has been suggested that sequestration of bile acids by intracellular bile acid binding proteins may also protect cells from bile acid cytotoxicity. Thus, the human bile acid binder (HBAB) was expressed in McNtcp.24 cells to determine if this class of proteins can protect against GCDCA cytotoxicity. Figure 9A shows the presence of the recombinant mRNA encoding the recombinant HBAB in clones that have incorporated the HBAB expression vector into their genomes. In addition, the HBAB protein abundance in the total lysates correlated with the abundance of the HBAB mRNA (Figure 9A). Analysis of radiolabeled TCA uptake (Figure 9B) showed that expression of HBAB had minimal impact on bile acid uptake despite the fact that the range of HBAB protein abundance was up to 5-fold greater than that in the lowest HBAB expressing cell. Moreover, the rates of decline in the amount of radiolabeled TCA associated with the cells after withdrawal of the radiolabeled bile acids from the culture medium was comparable among the different clones (Figure 9C), indicating that the rate of bile acid efflux from these cells was also not affected by the presence of HBAB. Expression of the human bile acid binder (HBAB) in McNtcp.24 cells and transport of bile acids in HBAB-expressing McNtcp.24 cells (BN cells). (A) The 2.0 kb recombinant HBAB mRNA is readily detectable in total RNA (10 μg) of selected BN clones. Note the absence of the recombinant HBAB mRNA in McNtcp.24 cells. The blot was stripped and reprobed with the mouse glyceraldehyde-3-phoshate dehydrogenase (G3PDH) cDNA to demonstrate the presence of mRNA in the samples analyzed. The recombinant HBAB protein is also readily detectable by immunoblotting in total lysates (20 μg) of BN and McNtcp.24 cells. The α-actin antiserum was used to demonstrate equivalent amounts of total proteins analyzed. (B) TCA uptake activity of the BN clones and McNtcp.24 cells are shown. The values are relative to the TCA uptake activity of McNtcp.24 cells (100 %). (C) Efflux of TCA from BN clones and McNtcp.24 cells. The cells were incubated with 25 μM [3H]-TCA for 20 min to label the intracellular pool of bile acids. The amount of radioactivity that remains associated with the cells after the removal of radiolabeled TCA from the medium is shown. The values represent means ± SD (n = 3). The slopes of the regression lines were compared by analysis of variance and no statistical differences were found. The experiments in (A) and (C) were repeated twice and the experiment in (B) was repeated three times with similar results. 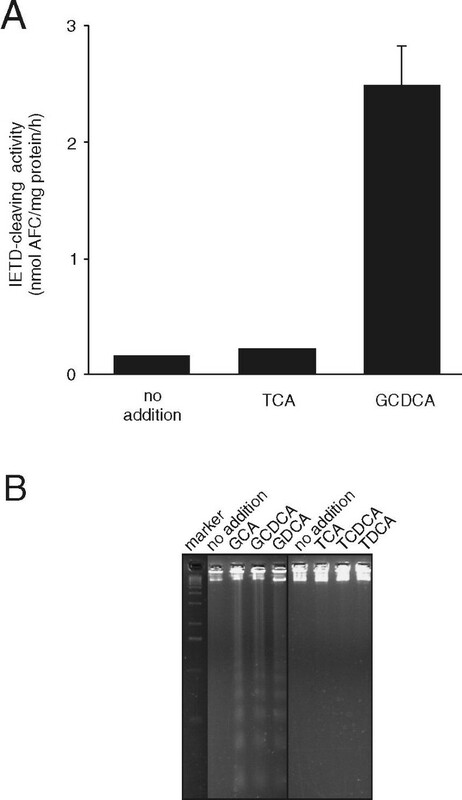 Incubation of the BN clones with GCDCA increased the LDH activity in the culture medium to a level similar to that in the medium of GCDCA-treated McNtcp.24 cells (Figure 10A). In addition, caspase 8 activity in bile acid-treated BN.25, BN.46 and BN.49 was comparable to that in McNtcp.24, which were elevated compared to that in McArdle RH-7777 cells (Figure 10B). The time course of caspase 8 activation in BN cells after treatment with 10 μM bile acids was similar to that observed for McNtcp.24 cells (Figure 10C). Therefore, the presence of an intracellular bile acid binding protein did not protect these cells from glycine-conjugated bile acid cytotoxicity, even at low bile acid concentrations. These results indicate that the activation of a signaling cascade involving PI3K is the dominant mechanism responsible for protecting McNtcp.24 cells from the cytotoxicity of glycine-conjugated bile acids. Sensitivity of BN cells to GCDCA treatment. The cytotoxic potential of GCDCA in BN and McNtcp.24 cells was assessed by measuring LDH release and caspase 8 activity. (A) LDH activity in the medium of cells treated with 100 μM GCDCA for 4 h. The values are relative to the LDH activity in the medium of GCDCA-treated McNtcp.24 cells (100 %). (B, C) Cells were treated with 50 μM GCDCA for 1 h and with 10 μM for 2 and 4 h. Caspase 8 activity was then assayed in cellular extracts. The values represent means ± SD (n = 3). The experiment in (A) was repeated three times and the experiments in (B) and (C) were repeated twice with similar results. In this study, we determined if the differential sensitivity elaborated by the liver-derived McNtcp.24 cell line to different classes of conjugated bile acids is limited to cells that normally transport bile acids. We previously demonstrated that taurine-conjugated bile acids are not toxic to McNtcp.24 cells . In contrast, glycine-conjugated bile acids induce apoptosis in McNtcp.24 cells and primary mouse hepatocytes, through activation of the Fas receptor in a FasL-independent manner [19, 25]. Moreover, GCDCA was demonstrated to activate both initiator and effector caspases, and that the apoptotic response can be blocked by Crm A, a caspase 8 inhibitor . The mechanism by which bile acids stimulate the activation of Fas receptor remains unclear. In Fas deficient hepatocytes, toxic bile acids were still able to induce apoptosis, suggesting that bile acids are capable of stimulating multiple pathways to initiate cell death . To gain further insight into the specificity of bile acid cytotoxicity, we conferred active bile acid uptake capacity in CHO cells, a cell type that does not normally metabolize bile acids, by expressing a bile acid transporter. CHO.asbt cells produce recombinant asbt with a molecular mass and kinetic parameters that are similar to previously reported values . It is not known if CHO cells have pathways capable of facilitating the efflux of bile acids out of the cell. The apparent efflux observed in CHO.asbt.35 could be attributed to the fact that asbt is capable a bidirectional transport of bile acids . However, it is conceivable that an efflux mechanism that recognizes bile acids exists in CHO cells and other mammalian cells. Indeed, yeast and plants express proteins capable of active bile acid transport . As these organisms do not normally synthesize bile acids, their ability to transport bile acids may illustrate a generalized mechanism for cellular transport of hydrophobic organic anions. CHO.asbt.35 cells were used as a model to assess the cytotoxic potential of taurine- and glycine-conjugated bile acids in non-hepatic derived and non-bile acid metabolizing cells. Unlike McNtcp.24 cells, treatment of CHO.asbt clones with taurine-conjugated bile acids resulted in cell death. TCA was the most potent of taurine-conjugated bile acid tested. It is unlikely that the observed cytotoxicity of the conjugated bile acids could be attributed to the generalized intracellular accumulation of bile acids because unconjugated bile acids were transported by CHO.asbt cells but did not cause significant release of LDH into the culture medium (Torchia and Agellon, unpublished observations). In contrast, glycine-conjugated bile acids (GCDCA in particular) were highly effective at causing the increase in LDH activity in the culture medium of both McNtcp.24 and CHO.asbt.35 cells. Primary hepatocytes exhibit differential sensitivity to taurine- and glycine-conjugated bile acids in culture . The bile acid-transporting WIF-B cells, which are rat hepatoma-human fibroblast hybrids , remain viable even when grown in TCA-containing culture medium for up to 14 days . In contrast, our study shows that taurine-conjugated bile acids is toxic to a cell type that is not normally exposed to bile acids. Liver cells, which normally metabolize bile acids, apparently possess a mechanism that can distinguish and differentially elaborate distinct biological activities of taurine- and glycine-conjugated bile acids. Both taurine- and glycine-conjugated bile acids induce apoptotic cell death in CHO.asbt.35 cells. The involvement of the caspase cascade in CHO.asbt.35 cells was illustrated by the fact that conjugated bile acids activated caspase 8 in a time dependent manner. However, the different profile of caspase 8 activation suggests that taurine- and glycine-conjugated bile acids may trigger apoptosis by different pathways. At present, it is not known how conjugated bile acids activate caspases in CHO.asbt.35 cells. A protein that is immunoreactive to a Fas receptor antiserum and has a molecular mass similar to the rat Fas receptor is detectable in CHO cell extracts (Torchia and Agellon, unpublished results). This leaves the possibility that conjugated bile acids may activate the apoptotic cascade through Fas receptor in this cell line, as glycine-conjugated bile acids do in hepatocytes . However, the activation of caspases does not require a specific kind of bile acid transporter since TCA is not toxic to McArdle RH-7777 cells irrespective of whether these cells internalize bile acids via ntcp or asbt. The differential response of McNtcp.24 cells to different classes of conjugated bile acids is apparently due to the selective activation of either a PI3K-dependent survival pathway [22, 23] or caspase-dependent death pathway . Indeed, neither taurine- nor glycine-conjugated bile acids stimulated PI3K activity in CHO.asbt.35 cells and both classes of bile acids were toxic. In addition, pre-treatment of McNtcp.24 cells with a PI3K inhibitor rendered these cells susceptible to TCA- and TCDCA- mediated cell death. The latter finding indicates that taurine-conjugated bile acids are capable of inducing apoptosis when PI3K is inhibited, probably by utilizing the same mechanism activated by glycine-conjugated bile acids. That TCA is able to activate PI3K in plasma membrane fractions from McNtpc.24 agrees with a previous study showing that TCA increases PI3K activity in canalicular and sinusoidal membrane vesicles . The activation of PI3K in that report was also associated with recruitment of sister of P-glycoprotein (the bile acid export pump) and other multidrug resistance proteins to the canalicular membrane . Extended treatment of McNtcp.24 cells does not appear to have detrimental and permanent consequences on cellular function. The marked morphological changes that occur during long term incubation with TCA  dissipate after the withdrawal of the bile acid from the culture medium, and the cells remain viable. The significance of an intracellular and high affinity bile acid binder in bile acid mediated cytotoxicity was also evaluated. Several proteins capable of binding bile acids in vitro have been identified (reviewed in ref. ). It is thought that the major bile acid binding protein in the cytosol of rat hepatocytes is 3α-hydroxysteroid dehydrogenase, a member of the aldo keto reductase supergene family . However, the exact role of this protein in intracellular transport of bile acids and cytoprotection was undefined. HBAB, a member of the human aldo keto reductase gene family, has been shown to bind bile acids with high affinity (<1 μM) and is postulated to play a similar role as 3α-hydroxysteroid dehydrogenase in human hepatocytes . Expression of HBAB in McNtcp.24 cells was expected to increase the capacity of these cells to sequester bile acids in the cytoplasm, and thereby reduce their toxicity. High level expression of HBAB had a negligible effect on the ability of the BN clones to take up or secrete bile acids, suggesting that HBAB has a minor role in the net transport of bile acids in these cells. 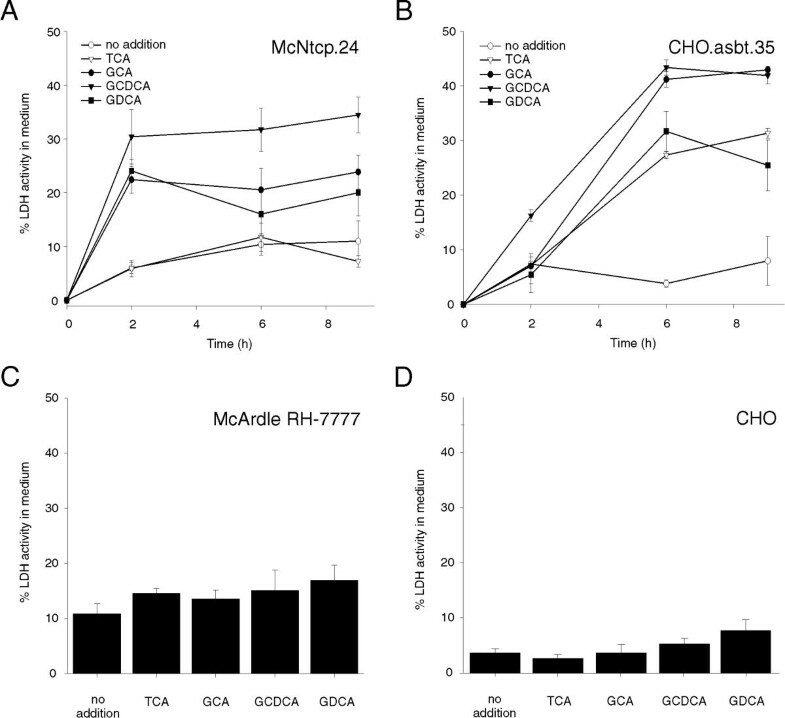 More importantly however, expression of HBAB in McNtcp.24 cells had no effect on GCDCA-induced cell death, even at low bile acid concentrations, indicating that this class of protein does not provide cytoprotection against toxic bile acids as previously suspected. This finding is consistent with the idea that bile acids directly modulate specific signaling cascades that control cellular death and survival. In summary, the failure of CHO.asbt cells to tolerate taurine-conjugated bile acids has revealed the existence of a mechanism that may be specific for cells that normally metabolize bile acids. Since bile acids undergo enterohepatic circulation, it would be reasonable to expect the existence of the same mechanism in other cell types that naturally transport bile acids, such as ileocytes and cholangiocytes [34, 35]. The last few years have brought significant advances in our understanding of bile acid transport in liver and intestinal cells. However, the regulatory potential of bile acids is only beginning to be realized. With the recent discovery that bile acids represent the natural ligands for the nuclear receptor FXR [10–12], there is heightened interest in identifying the genes that are regulated by bile acids. Insight into how bile acids directly modulate a variety of other cellular functions will be important in understanding the significance of cellular responses to bile acids. Tissue culture reagents were purchased from Canadian Life Technologies (Burlington, ON, Canada). [3H]-Taurocholic acid (2.6 Ci/mmol), [32P]-dCTP (3000 Ci/mmol), and [32P]-ATP (3000 Ci/mmol) were purchased from Amersham Pharmacia Biotech (Baie d'Urfe, QC, Canada). Bile acids were obtained from Sigma-Aldrich Canada Ltd. (Oakville, ON, Canada) and Calbiochem-NovaBiochem Corp. (San Diego, CA, USA). Other reagents purchased from various commercial suppliers were of analytical grade. McNtcp.24 cells were cultured as described previously . Chinese hamster ovary K1 cells were cultured in Ham's F12 medium supplemented with 10% fetal bovine serum. To establish cell lines stably expressing asbt, a cDNA encoding the hamster asbt  was cloned into pBK-CMV expression vector (Stratagene, La Jolla, CA). The prokaryotic promoter embedded in the 5'-untranslated region of the encoded recombinant eukaryotic mRNA was removed from the resulting plasmid. The human bile acid binder (HBAB) cDNA  was cloned into a derivative of pCep4 (Invitrogen Corp., Carlsbad, CA), that had been previously modified by deleting the EBNA 1 gene . The lipofectamine reagent (Canadian Life Technologies) was used to transfect the expression plasmid into CHO, McArdle RH7777, and McNtcp.24 cells. The cell medium was replaced 24 h post-transfection with medium containing G418 (400 μg/ml) or hygromycin (500 μg/ml) to select for stable transfectants. Surviving colonies were expanded and assayed for the ability to take up [3H]-TCA from the culture medium as described previously  or assayed for the expression of HBAB by immunoblotting. Total RNA from CHO.asbt and BN cells was prepared and analyzed by RNA blotting as previously described . Cell lysates were prepared by lysing cells in 50 mM Tris-HCl (pH 7.4), 1% NP-40%, 0.25% sodium deoxycholate; 150 mM NaCl, 1 mM EGTA, 1 mM Na3VO4, 1 mM sodium fluoride, containing a protease inhibitor cocktail (Sigma-Aldrich Canada Ltd.). The lysates were fractionated by polyacrylamide gel electrophoresis and then transferred to Immobilon-P membrane (Millipore Ltd., Nepean, ON). Asbt was detected using a rabbit antiserum directed against the last 14 amino acids of the carboxyl terminal of the hamster asbt protein. HBAB protein was detected as previously described . Uptake studies in CHO.asbt, BN and McNtcp.24 cells were done as previously described . Protein content was determined using the Bradford method  with bovine serum albumin as the standard. Cells (104 per well) were grown on 24 well multiwell plates for 16 h. The cells were then washed with phosphate buffered saline (PBS) and then incubated in medium (Ham's F12 or Dulbecco's modified Eagle's medium (DMEM)) containing 100 μM bile acids for 1 to 5 h as detailed in the Figure legends. The media was collected and adjusted to 0.1% Triton X-100. Cells remaining on the dish were dissolved in medium (Ham's F12 or DMEM) containing 0.1% Triton X-100. LDH activities in both the cell lysates and media were measured as described previously . Cells (106 per 60 mm dish) were grown for 16 h. After washing with PBS, the cells were incubated with 50 μM bile acids for 3 h at 37°C. Adherent and non-adherent cells were dissolved in Tris-buffered saline (pH 7.6) containing 10 mM EDTA and 0.5% sarkosyl, and 1 mg/ml proteinase K. After digestion (~16 h) of cellular proteins at 55°C, DNA was sequentially extracted with phenol/chloroform and chloroform. The DNA was precipitated, washed in 70% ethanol, and dissolved in buffer containing 10 mM Tris-HCL (pH 7.5) and 1 mM EDTA. The isolated DNA was treated with RNase A and then analyzed by conventional agarose gel electrophoresis . DNA was visualized with ultraviolet light after ethidium bromide staining. Cells (106 per 60 mm dish) were grown for 16 h. After washing with PBS, the cells were incubated with 50 to 100 μM bile acids for 1 to 2 h. After the incubation period, the medium was discarded and adherent cells were harvested in PBS and sedimented by centrifugation (500 × g). The cells were resuspended in buffer containing 50 mM Tris-HCl (pH 7.5), 1% Nonidet P-40, and 150 mM NaCl. Following 10 min incubation on ice, lysed cells were centrifuged for 10 min, 10,000 × g at 4°C. The supernatant was assayed for caspase activity in 20 mM Piperazine-N,N'-bis(2-ethanesulfonic acid) (pH 6.8), 100 mM NaCl, 1 mM EDTA, 1% CHAPS, and 10% sucrose with Z-IETD-AFC for caspase 8 [42, 43]. The release of the fluorogenic-leaving group was detected by excitation at 400 nm and emission at 505 nm. Free AFC was used to generate standard curve. Crude membrane fractions were isolated from CHO.asbt and McNtcp.24 cells as described previously . To prepare lipid suspension, phosphatidylserine and phosphatidylinositol (1:1) were sonicated in 25 mM 3-(N-morpholino)propanesulfonic acid (MOPS; pH 7.0), 1 mM EGTA, 1 mM Na3VO4. Cell extracts were assayed in 25 mM MOPS (pH 7.5), 5 mM MgCl2, 1 mM EGTA, 1 mM Na3VO4, 130 μM ATP, 20 μCi [32P]-ATP (3000 Ci/mmol) and 0.2 mg/ml sonicated lipids. The reaction was allowed to proceed for 10 min at 37°C and stopped by addition of 300 μl of 1N HCl:methanol (1:1). Lipids were extracted twice with 350 μl chloroform and the organic phases from both extractions were combined then washed once with 700 μl 1 N HCl/methanol (1:1). Lipids were dried, and then taken up in chloroform:methanol (1:1). The samples were spotted along with pure phosphoinositol phosphate standards (Avanti Polar Lipids, Alabaster, AL, USA) onto 1.2% potassium oxalate impregnated TLC plates . The chromatogram was developed in chloroform: methanol: water: aqueous ammonia (90:70:17:3) . The incorporation of [32P] into phosphatidylinositol was quantitated by phosphorimaging using a Fuji BAS1000 phosphorimager. Visualization of standards was done by dippingTLC plates in 10% CuSO4,10% H3PO4 and heating at 200°C for 10 min. Each set of experiments was repeated at least twice. The data is represented by means ± SD. Differences between control and test cells were evaluated by a Student's t test. Differences in the slope of regression lines were evaluated by analysis of variance. P values of <0.05 were considered statistically significant. This research was supported by grants from the Canadian Institutes of Health Research, the Heart and Stroke Foundation of Alberta & NWT, and in part by Novartis Pharmaceuticals Canada Ltd. ECT was supported by a Studentship from the Alberta Heritage Foundation for Medical Research. LBA is a Senior Medical Scholar of the Alberta Heritage Foundation for Medical Research.